The week of June 15 2015 marks the 800th Anniversary of the sealing of the Magna Carta. Described as 'England's greatest export', the Magna Carta has had an extraordinary impact on the influence of law and is the foundation for the notion of limited government. The Honourable Society of Gray's Inn and the Bingham Centre for the Rule of Law invite you to a lecture by Chief Justice McLachlin P.C. who will examine the impact of the Magna Carta abroad and its relevance today. Chief Justice McLachlin's judicial career began in April 1981 when she was appointed to the Vancouver County Court. In September 1981, she was appointed to the Supreme Court of British Columbia. Elevated to the British Columbia Court of Appeal in December 1985, she was appointed Chief Justice of the Supreme Court of British Columbia in September 1988. Seven months later, in April 1989, she was sworn in as a Justice of the Supreme Court of Canada. On January 7, 2000, she was appointed Chief Justice of Canada, the first woman in Canada to hold this position. Open to members of all Inns, worth 1.5 CPD for barristers and solicitors. 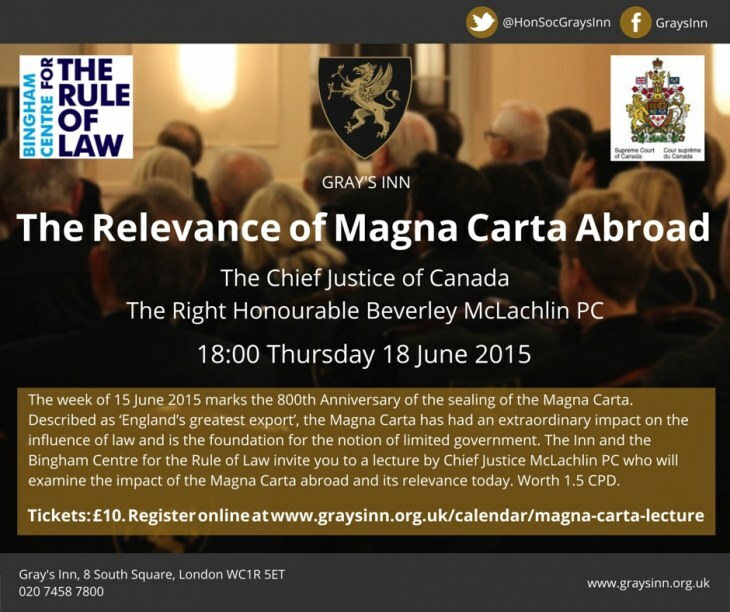 "The Relevance of Magna Carta Abroad"